Learn about a civil rights opera in Atlanta, an activist orchestra in NY, the Women's Opera Network & a lesbian opera revival. "I wanted to write an opera about the struggle of African Americans, because an opera would give me the space to express the fear, the anger, the sorrow, the love, the faith, the determination, and the joy of working together . . . It was my way of paying respect to the greatness of the ordinary people who suffered and died to bring about change in this country." 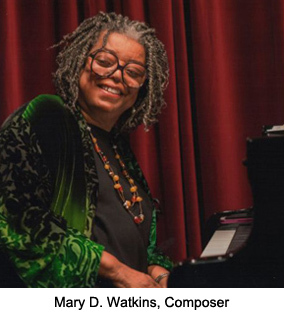 WomenArts has been working with composer Mary D. Watkins for the past five years to develop her opera originally known as Dark River: The Fannie Lou Hamer Story. We collaborated with the Mount Holyoke Symphony Orchestra to present a full-cast version in Massachusetts in April 2014. This year we have been working to develop a smaller, more portable version of the opera's highlights. We have been collaborating with Atlanta's prestigious National Center for Civil and Human Rights and the innovative Agnes Scott College, and we are proud to announce that the Southern Premiere of the concert version will take place on Sunday, April 24, 2016 at 3 p.m. in Presser Hall at Agnes Scott College in Decatur, GA. Admission is free, but reservations are recommended. Reserve tickets online at: fannielouhamer.brownpapertickets.com. Fifty years ago, Fannie Lou Hamer was one of the first African-Americans to register to vote in Mississippi. She became a leader in the Student Non-Violent Coordinating Committee and the Mississippi Freedom Democratic Party and she endured death threats, beatings, and imprisonment in order to obtain voting rights for her people. Although Fannie Lou Hamer was the daughter of sharecroppers with little formal education, her electrifying speech prior to the Democratic National Convention in 1964 focused national attention on voter inequality. She was a key figure in the movement that pushed President Johnson to sign the Voting Rights Act of 1965, which outlawed discriminatory voting practices. She often sang at rallies to motivate the crowds. The opera is especially timely because the voting rights that Fannie Lou Hamer fought for are under attack once again. The Supreme Court recently invalidated the enforcement provisions of the Voting Rights Act of 1965, and as we move towards the November elections, some states are trying to impose new restrictions on who can vote. The opera also captures the particular challenges faced by women activists – Fannie Lou Hamer had to fight against sexism as well as racism throughout her life. The opera explores Fannie Lou Hamer's decision to fight for her rights, her challenges, her triumphs, and the impact of her activism on her husband and children. 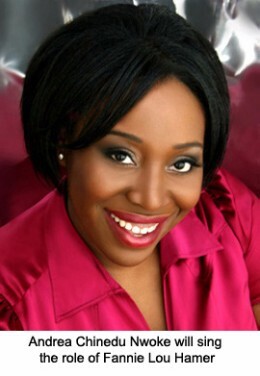 Andrea Chinedu Nwoke from New York and Philip Lima from Boston will play the roles of Fannie Lou Hamer and her husband Pap Hamer, accompanied by a 12-member chorus and the Agnes Scott College Community Orchestra conducted by Qiao Solomon. The performance will also include two orchestral pieces by African-American composers, Soul of Remembrance by Mary D. Watkins and Afro-American Symphony by William Grant Still. Special thanks to the National Endowment for the Arts, the Starry Night Fund, the James T. and Ella Rather Kirk Fund, and Delta Airlines for their generous support. 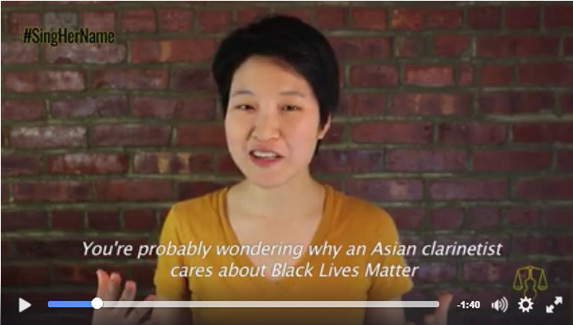 Click the video above to learn about an activist orchestra that is raising funds to do a musical tribute to black women because ‪#BlackWomenMatter‬! This looks like a great group - please help them if you can! Opera America has been an excellent champion of women composers through their Opera Grants for Female Composers. Now they are studying other women in the field and looking for ways to increase the percentage of women in leadership positions. They have done two recent studies which discovered low percentages of women leaders in opera. 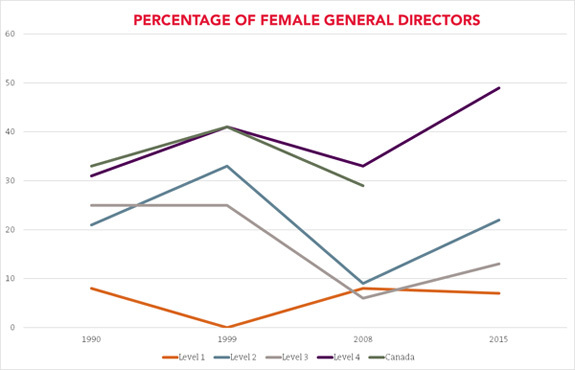 For instance, the graph below shows that the percentage of female general directors in Level 1 companies with budgets over $10 million has remained under 10% since 1990, and it has mostly remained under 30% for the next two budget categories. The only companies that come close to gender parity are the Level 4 companies with the smallest budgets - a pattern we have seen in many other art forms. Patience And Sarah Returns to New York for Pride Week! 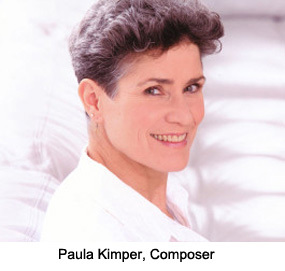 Patience and Sarah, a lesbian-themed chamber opera written in 1998 by Paula M. Kimper and Wende Persons, is making a comeback with two staged concert performances at The Players Theatre in New York on June 23 & 24. This is an early work by Paula Kimper whose opera Truth, about the inspiring abolitionist, Sojourner Truth, was a big hit during SWAN Day 2012. Set in Connecticut in the winter of 1816, Patience & Sarah tells the powerful story of two young women who meet, fall in love and resolve to devote their lives to each other. The artist Patience White, sister to a middle-class Connecticut landowner, and tough-minded, adventurous Sarah Dowling, the daughter of a poor farmer, share a mutual dream of leaving behind their repressive families to go pioneering together. The opera is based on the 1969 novel by Isabel Miller, which in turn was inspired by the true story of two 19th-century women, the painter Mary Ann Willson and her companion Florence Brundage. Today Willson is recognized as an outstanding primitive artist. Her paintings may be seen in the National Gallery of Art in Washington, D.C., the Museum of Fine Arts in Boston, Massachusetts, and the Folk Art Museum in Cooperstown, New York. Women in the Arts and Media Coalition in collaboration with WomenArts and the League of Professional Theatre Women is publishing free monthly newsletters for theatre and film/video artists listing submission opportunities, grants, auditions, residencies and more. You can follow #StageOpps and #ScreenOpps on Twitter or see the latest issues by visiting the Coalition's website. Copyright © 2016 WomenArts, All rights reserved. You are receiving this email because you signed up for a WomenArts email list.